The Saturday Evening Post is a bimonthly American magazine. It was published weekly under this title from 1897 until 1963, biweekly until 1969, and quarterly and then bimonthly from 1971 to the present. In the 1920s to the 1960s, it was one of the most widely circulated and influential magazines for the American middle class, with fiction, non-fiction, cartoons and features that reached millions of homes every week. 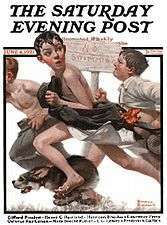 The Saturday Evening Post was founded in 1821 and grew to become the most widely circulated weekly magazine in America. The magazine gained prominent status under the leadership of its longtime editor George Horace Lorimer (1899–1937). The editors claimed it had historical roots in Benjamin Franklin, The Pennsylvania Gazette which was first published in 1728 by Samuel Keimer and sold to Franklin in 1729. It discontinued publication in 1800. The Post also employed Nebraska artist John Philip Falter, who became known "as a painter of Americana with an accent of the Middle West," who "brought out some of the homeliness and humor of Middle Western town life and home life." He produced 120 covers for the Post between 1943 and 1968, ceasing only when the magazine began displaying photographs on its covers. Another prominent artist was Charles R. Chickering, a freelance illustrator who went on to design numerous postage stamps for the U.S. Post Office. Other popular cover illustrators include the artists George Hughes, Constantin Alajalov,. John Clymer, W. H. D. Koerner, J. C. Leyendecker, Charles Archibald MacLellan, John E. Sheridan, Douglass Crockwell, and N. C. Wyeth. Each issue featured several original short stories and often included an installment of a serial appearing in successive issues. Most of the fiction was written for mainstream tastes by popular writers, but some literary writers were featured. The opening pages of stories featured paintings by the leading magazine illustrators. The Post published stories and essays by H. E. Bates, Ray Bradbury, Kay Boyle, Agatha Christie, Brian Cleeve, William Faulkner, F. Scott Fitzgerald, C. S. Forester, Ernest Haycox, Robert A. Heinlein, Kurt Vonnegut, Paul Gallico, Normand Poirier, Hammond Innes, Louis L'Amour, Sinclair Lewis, Joseph C. Lincoln, John P. Marquand, Edgar Allan Poe, Sax Rohmer, William Saroyan, John Steinbeck and Rex Stout and Rob Wagner. It also published poetry by such noted poets as Carl Sandburg, Ogden Nash, Dorothy Parker and Hannah Kahn. ↑ "eCirc for Consumer Magazines". Alliance for Audited Media. December 31, 2012. Retrieved June 18, 2013. 1 2 The Saturday Evening Post Society. 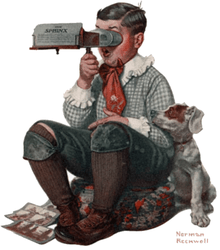 "On Our Birthday, a Look at Our Earliest Issues". ↑ Tebbel, John. 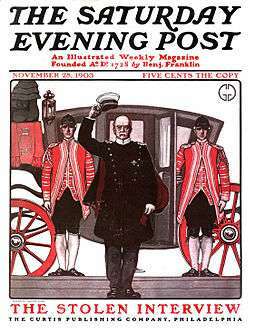 George Horace Lorimer and the Saturday Evening Post. Doubleday & Co., 1948. ↑ Denny, Diana (2011-12-30). "Classic Covers: Constantin Alajalov". The Saturday Evening Post. Retrieved 2013-05-23. ↑ "Jack London: First edition of The Call of the Wild in the Saturday Evening Post". manhattanrarebooks-literature.com. The Manhattan Rare Book Company. Retrieved February 9, 2010. ↑ "The Art of Fiction – P.G. Wodehouse" (PDF). The Paris Review (reprint ed.). 2005. p. 21. Archived from the original (pdf) on 2008-05-29. Retrieved 2008-06-09. ↑ Applebome, Peter. "William A. Emerson Jr., Editor in Chief of Saturday Evening Post, Dies at 86", The New York Times, August 26, 2009. Accessed August 30, 2009. ↑ Lambert B. Martin Ackerman, 61, publisher; closed The Saturday Evening Post. New York Times. 1993-08-04. ↑ Bedingfield, Robert E. "February 8 Issue of Saturday Evening Post to Be Last", The New York Times, January 11, 1969. Accessed August 29, 2009. ↑ Carmody, Deirdre. "Magazine staff says sad good-by; Post Secretaries Find a Rose on Desk to Mark the Day", The New York Times, January 11, 1969. Accessed August 29, 2009. ↑ Dougherty, Philip H. "Postmortem on Saturday Evening Post", The New York Times, March 30, 1969. Accessed August 29, 2009. ↑ "Return of the Post". Time. June 14, 1971. Retrieved 2008-04-12. ↑ Anonymous (June 14, 1971). "Return of the Post". Time. Retrieved 2008-04-12. 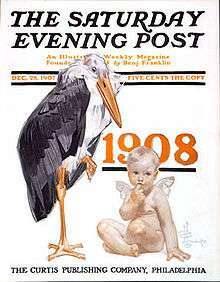 ↑ "Around the Nation: Saturday Evening Post Sold to Franklin Society". The New York Times. January 10, 1982. Retrieved 2010-09-28. ↑ Melissa Mace (Fall 2005). "Beyond the Original Mission". Iowa Journalist. Retrieved 2010-09-28. ↑ "Saturdayeveningpost.com publishes a classic American bi-monthly magazine". Retrieved 2010-09-28. ↑ "Company News: Briefs". The New York Times. June 26, 1991. Retrieved 2010-09-28. ↑ Bloomgarden-Smoke, Kara (January 15, 2013). "Magazine Success Story: The Saturday Evening Post Keeps on Going". New York Observer. Retrieved April 3, 2014. ↑ The Saturday Evening Post Society. "Rockwell—1940s – The Saturday Evening Post". ↑ "Letters: From the Editor". The Saturday Evening Post. Retrieved July 7, 2009. ↑ Smith, Steve (January 18, 2012). "Steve Slon to Lead The Saturday Evening Post". Retrieved January 31, 2012.